Going out to brunch this weekend? Oh my gosh me too! Since we’ve got so much in common, I’m going to share a little brunch-time tip a.k.a. the best thing I learned in 2010. Next time you’re about to order a mimosa off the menu, stop and ask yourself: “Is this delicious treat really worth $9 a pop?” Probably not. Especially when you could just get a bottle of champagne and a carafe of OJ and make your own cocktails at half the price. I’m no mathematician, and this is a simple approximation based on my two favorite spots in San Francisco (ones that now hate me), but making your own mimosas seems like a no-brainer. Just be prepared to make your case. Your server will, understandably, be a little confused. 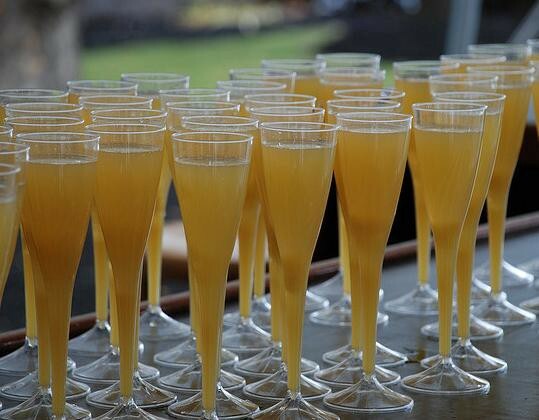 “Umm, you do know we have mimosas on the menu,” he might say. And here’s where you’ll have to be really cool and calm and sweet and act like this is perfectly normal and that everyone does it, because they really should. Say it with confidence because you know he secretly thinks you’re smarter and thriftier than his other patrons. Later he might notice that you’re also drunker than his other patrons, but isn’t that kind of the point? Tania Khadder is a writer and editor living in San Francisco. Give her a reason to update her blog.